Hobart Cabins and Cottages offer 3.5 star budget self contained cabins, cottages and holiday homes delightfully situated on 3 acres of magnificent park like gardens. Hobart Cabins and Cottages is a true oasis in the city. The parkland setting will help you relax after a busy day with the well-maintained gardens an inspiration to any garden lover. These newly refurbished cabins are the most central in Hobart, just nine minutes from the Hobart CBD and the popular Salamanca Market, just a five minute walk from the entertainment centre and show grounds and only five minutes from the ever popular Cadbury Chocolate Factory. All types of travellers can take advantage of the discount accommodation at the Hobart Cabins and Cottages, as well as the range of modern amenities including direct internet access, disabled facilities, free car parking, guest laundry, tour desk, bbq and garden. Small grocery items are available from the office. Hobart Cabins and Cottages are set in a charming family park with all the splendor of modern living - close to every thing or just come and relax in the tranquil garden settings. Your hosts Karen and Brendon Cate will welcome you to explore the amazing experience Hobart and its people have to offer. . Nearby Attractions : Attractions include river cruises, golf courses, chocolate factory, Brewery tours, jet boat rides and Tasmania's best seafood by the wharf caught fresh daily. History to see every where you go with Richmond's historic township and Tassies oldest jail and bridge. View Hobart from the famous Mt Wellington. Take a Double Decker bus tour all around Hobart. Come and try some of the best restaurants in Tassie all only nine minutes away. 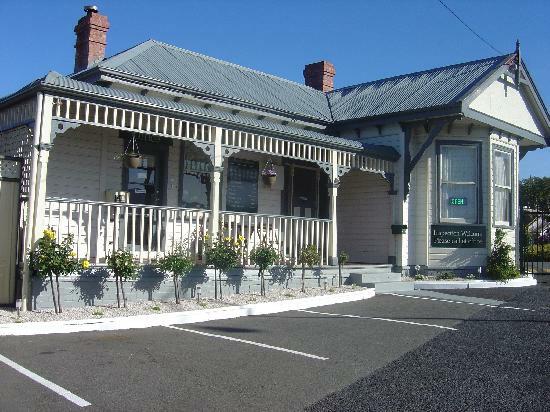 Address : 19 Goodwood Rd Glenorchy Tasmania. 1 Bedroom Deluxe Cabin : Sleeps up to 5 guests on 1 Double Bed & 3 Tier Bunk Bed. 1 Bedroom Rose Cottage : Sleeps up to 5 guests on 1 Queen Bed. 3 Bedroom 2 Bathroom House : Sleeps up to 10 guests on 2 Queens & 3 Sets Of 2 Bunk Beds..